Love vintage items and macarons? Jouer is the place to be! Jouer literally means “to play” in French. Nestled in the cozy Sau Wa Fong square in Wanchai, Jouer is the brainchild of Anne Cheung - the Founder and Executive Chef of Jouer, who chose this particular name because of her passion for creating, thinking out of the box and presenting French pastries in playful, exciting ways. The new atelier is a workspace as well as a “playground” to integrate “art and lifestyle” with “food and beverage”. We were absolutely in awe of the artistic and exquisite pastry installations. Jouer Patisserie is also a lifestyle concept retail space selling exquisite macarons gift boxes, stylish tableware, voguish home décor, as well as vintage accessories and trinkets, providing creative lifestyle experiences for customers. The front part of the atelier is a gallery displaying modernized vintage style furniture, tableware, decoratives and trinkets, vintage accessories and jewelry sourced from all over the world. At the back of the atelier is an open pastry bar facing the outdoor patio, where customers can experience the playful and artsy lifestyle that Jouer is presenting. The outdoor patio of the atelier has a long dining table made of wood acting as a stage to present Jouer’s pastry installations and allow them to change the themes from time to time. Guests can spend a day enjoying exquisite maracons, seating around the dining table and daybed at the backyard, have a relaxing afternoon in the lovely environment. This patio is the perfect hangout for small gatherings, wine tastings and more! On the side of the store, the facade is the most prominent feature of the whole exterior, the six-paneled black iron gate with an art nouveau pattern, spans across a stark white wall when it is opened. 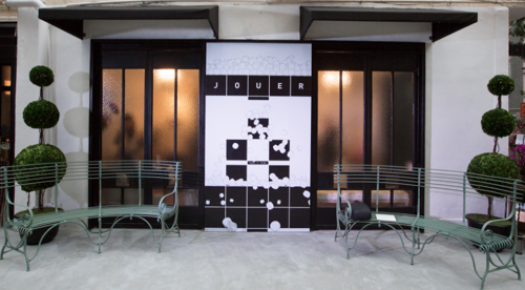 The façade reiterates the black & white motif of Jouer’s brand identity. For plant lovers, there is a pair of green iron art nouveau benches against the front end of the facade, flanked by two 3-tiered topiary plants, creating a picturesque backdrop reminiscent of a Parisian garden. The shop’s star products are the mini French macarons with innovative unconventional flavors, including Chinese Vinegar and Ginger, Mango Pomelo, Tom Yum, Kaya and Salt, HK-style Milk Tea, Cosmopolitan, etc. The unique flavors were influenced by Anne’s Asian roots and her French culinary training.